My favourite meal of the day is undoubtedly breakfast. Some say its the most important meal of the day and this is especially true when you are travelling. A decent breakfast can give you the fuel needed for a day of adventure or sightseeing. There is nothing quite like a delicious early morning meal – especially when it is prepared by someone else. The European breakfast menu can vary immensely depending on your location. But there is also a great deal of over lap between neighbouring countries on the continent. 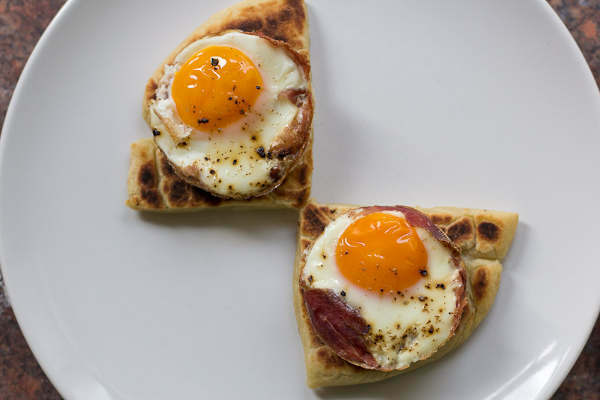 In the article below we will give you are top five European breakfast dishes by country and summarise the best of the rest. But first, lets look at a few general dishes you are likely to find in multiple countries across Europe. As the name suggests, the continental breakfast is named after the continental European countries where it is popular. A continental breakfast is usually a light buffet of fruits, juices, coffee and pastry products. Sliced bread, rolls, croissants or pastries are offered alongside butter, jams, honey, cheeses, or sliced meats. A decent breakfast buffet may offer all of these, and maybe also cereals, yogurts and various other hot drinks. 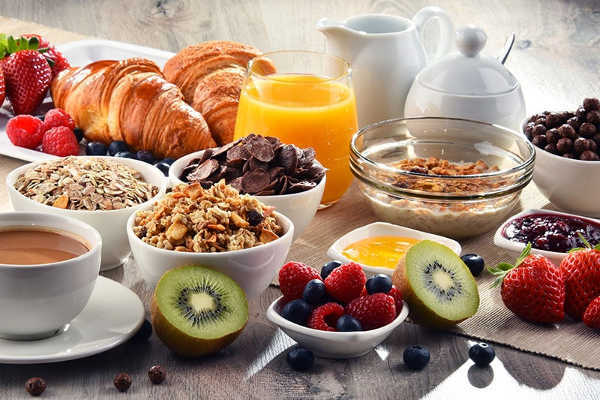 Its is common to find a continental selection on hotel breakfast menus across Europe, but It is also a popular choice in North America. You will find some version of this cooked grain dish on every continent in the world. However, it has been a staple for many European breakfast menus for thousands of years. 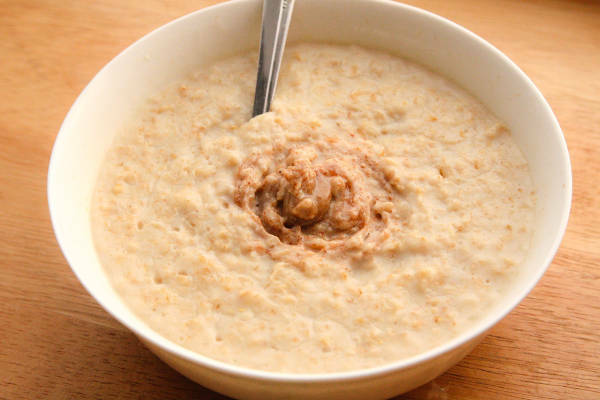 Oat porridge has been found in the stomachs of 5,000 year-old neolithic ‘bog bodies’ buried in Scandinavia. But according to Marta Mariotti Lippi at the University of Florence in Italy, Europeans have been eating porridge for over 32,000 years. Lippi and her colleagues discovered processed oat grains on stone grinding tools belonging to Palaeolithic hunter-gatherers from Southern Italy – Mind blown! In the words of our beloved editor and founder “nothing beats a bowl of well prepared porridge with a spoonful of honey and a hint of cinnamon”, he is a man of simple pleasures for sure. With that said, when it comes to a simple breakfast dish that ticks all the boxes, porridge has it all. Slow release energy, delicious if prepared correctly, and described by many as a health super food. Yum yum! Although porridge is a common breakfast dish across Northern Europe, from the UK right across to Russia, actually finding it on European hotel breakfast menu is a lottery. These days it is the preserve of boutique hotels, B&B’s and smaller operators, but occasionally you will be surprised to see a vat of porridge in the larger chains. OK, so the Danish breakfast has made it onto this list by some personal bias on my part. I spent a few years living in Denmark and fell in love with the local dark rye bread. If you sample the rye bread from a real artisan bakery, as opposed to the rubbery version sold in supermarkets, you will see what I mean. A fibre frenzy! 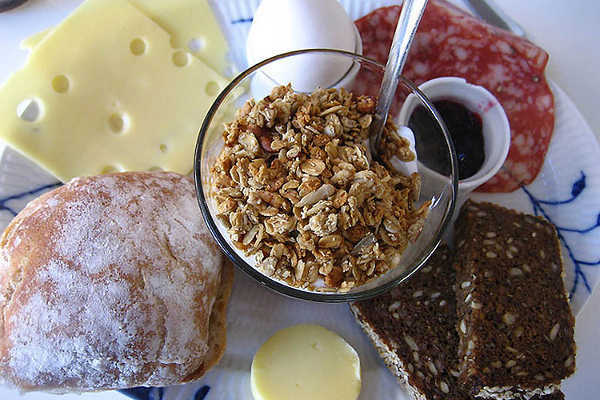 Rye bread is not the end of the story; a typical Danish breakfast includes some other splendid ingredients. Cheeses, hard boiled eggs, cold meats such as a salami, white bread, jam, fruit and muesli with yogurt. Plus those famous divine Danish pastries of which there are many varieties. You start to get the picture of how great a typical Danish breakfast buffet looks – Lets leave it at that! 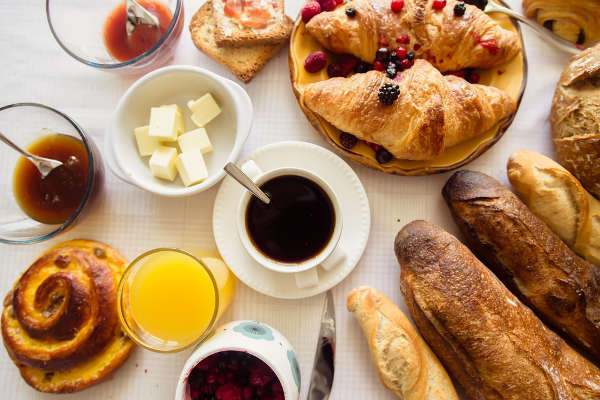 The French breakfast can be described as a very basic continental breakfast, which we have already discussed in detail above. So why include it on out list of top five best breakfast dishes? Quite simply put, quality! A typical French breakfast is sweet love affair between delicious pastries and home made fruit preserves. A tartine, is a French open face sandwich, and during the breakfast hour this is basically a slice of baguette with butter and jam. This is not merely bread and jam people, this is art personified. Lets break it down. Nothing beats French bread! Thats right, I said it! Due to French traditions, customs, culture and even laws (the 1993 bread decree), the French baguette is prepared to perfection by local “boulangeries”. Strict regulations dictate how the bread must be prepared and baked. No pre-prepared dough – only freshly made. No added chemicals – natural fermentation only. Strictly no additives or preservatives. The French take their bread baking VERY seriously. The result speak for themselves. About the best bread you will find anywhere on this fine planet. Any legit French establishment serving breakfast, will source their bread from local bakers just before you eat it. Carb heaven. French fruit preserves can hang with the best of them. While it is common to find store bought jam on the menu, any hotel doing worth its salt will make their own or source an artisan jam. Juicy plums, sweet figs, tender pears, mature quinces and soft medlars are used to make beautiful French jams. The thought of perfect plum jam spread across a fresh French baguette brings tears to our eyes – What drama! Tartines are just the tip of the proverbial breakfast iceberg. The French croissant still reigns supreme (according to the French at least). The croissant au beurre is a croissant made with butter as opposed to margarine, and tho will not find a better croissant outside of France. The pain au chocolat is a sweet French roll containing chocolate and served warm, this awesome breakfast treat will scupper your healthy eating plan before the day has even got going, but its worth it. A traditional brioche is a beautiful delight, especially if you are conditioned to dry supermarket brioche..
A peculiar ritual during the French breakfasting period is that of the coffee dunk. Be prepared to witness locals dunking their tartine, croissant, or pain au chocolat into the coffee. Sweet or savoury? the eternal breakfast debate. I am not particularly a fan of sweet breakfast dishes, but there is one exception. Churros, or Spanish doughnuts, are a guilty breakfast pleasure and the ultimate sweet breakfast treat. A simple dough mixture of only butter, water, flour and eggs, is squeezed through a ‘churrera’ machine which shapes the dough into a long thin star shaped doughnut. It is fried and then sprinkled with sugar. The shape and texture of the churro can vary from region to region in Spain. In Andalusia they have several different styles; a thicker churro which is turned as it leaves the churrera to form a spiral shape, and a thin walled style which is served without the sugar. Churros can be eaten at anytime of the day as a sweet snack, but they are most popular at breakfast time. 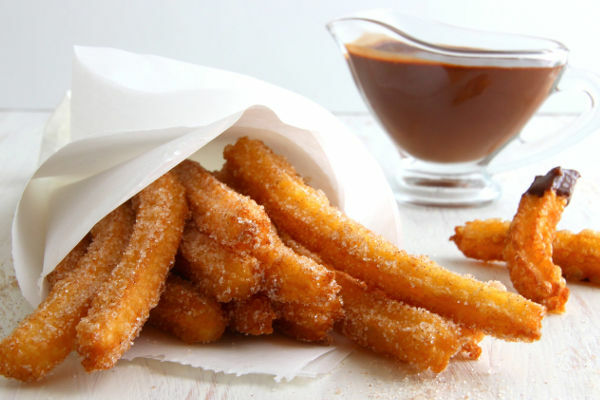 They are served with a pot of chocolate sauce for dipping and a coffee with milk in which the churros can also be dipped. It is also common to have a jug of sangria with your breakfast churros…..OK, so I made that last bit up, but it sounds great! You will never get bored with the Bulgarian breakfast with so many delicious traditional dishes from which to choose. Admittedly, many of the dishes below are served individually, but that should not to stop you mixing it up. You can find a breakfast buffet which will serve all of these dishes at the same time at many local hotels. A staple of the Bulgarian breakfast menu, and in my opinion its standout delicacy. 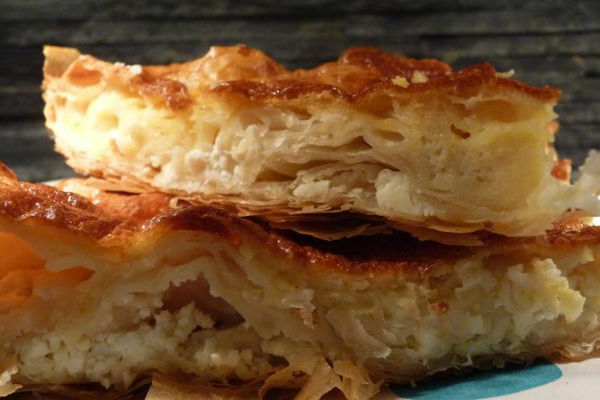 The banitsa is a pastry from the börek family, of thin phylo layered pastries with a filling. Some describe the banitsa as a cheese pie, which is not far from the truth; it is similar to a cheese pasty in many ways. The primary ingredient is an egg and cheese mixture, but vegetables can also be added including spinach, sorrel, leeks, onions, parsley or cabbage. In certain regions you can find a meat filling, or a sweet filling. It is baked in the oven and served either hot or cold. 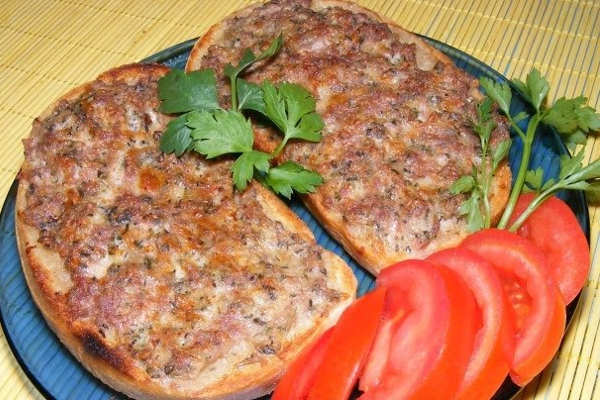 The princess is a ground meat open faced sandwich typical in Bulgaria, and a common breakfast choice. Ground beef or pork, onion, ginger, thyme and cumin are are cooked into a soft paste which is spreadable. Its almost like a hamburger spread. You can sprinkle cheese over the sandwich as an extra. A mekitsa is a deep fried leavened dough similar to a Hungarian Lángos. They are served with jam, honey, cheese or yogurt. Popara is a dish made with old bread cut into pieces and cooked with either milk or water and butter until the bread has soaked up the liquid into a moist gooey consistency. The dish is then mixed with either honey and sugar or cheese. Very simple, yet very tasty. Rodopski Kolatsi is a Bulgarian breakfast pancake made from egg, flour, yogurt, salt, oil and baking powder. It is formed into thick round pancakes and fried similar to the American style pancakes. It is served with jam, honey and cheese. Along with breads and cheeses a cold meat platter can be served as a family breakfast. Typcial Bulgarian cured meats include: Banski starets (spicy sausage), Elenski but (cured ham sausage with herbs), Lukanka (spicy salami of minced beef and pork), Pastarma (air-dried cured beef ) and Sujuk (flat cured, dry spicy sausage). Two traditional Bulgarian beverages that are drank at breakfast times. Boza is a sweet malt drink popular across the Baltic region. It has a small alchohol content of around 1%. Ayran is a simple drink that mixes yogurt with water and a pinch of salt. 1. The United Kingdom and Ireland – The Full Monty! I hear the cries of foul play resonant across the interweb. Our winner is in fact not one country, but five! So as not to dominate the list with slightly different versions of the same dish, we have lumped them all together. Slightly controversial, but we are sticking with our decision. Each of these countries has its own variation of the “the Full breakfast”. Individually these are the full English (England), the full Irish (Republic of Ireland), the full Scottish (Scotland), the full Welsh (Wales), and the Ulster fry (Northern Ireland) breakfasts. What are they? In a nutshell, a festival of meat, grease, carbs and protein. Used in local folk medicine to cure excessive alchohol consumption. The full breakfast will either make you, or break you. Its not for everyone that’s for sure. As a Brit on my travels, if the breakfast topic is ever discussed, I always receive one of two opinions. “You guys have the best breakfast ever” or “How the hell do you guys eat that stuff in the morning”, both valid points. The full breakfast has saved my life on many occasions, but it has also given me heartburn for 12 hours on others. Its a complicated relationship. Lets look at each variation of this regional classic and go from there. Starting in alphabetical order to avoid favouritism. The full English breakfast is a regional classic dish that contains some combination of the following ingredients: back bacon, sausage, egg, toast/fried bread, fried/grilled tomato and mushrooms. 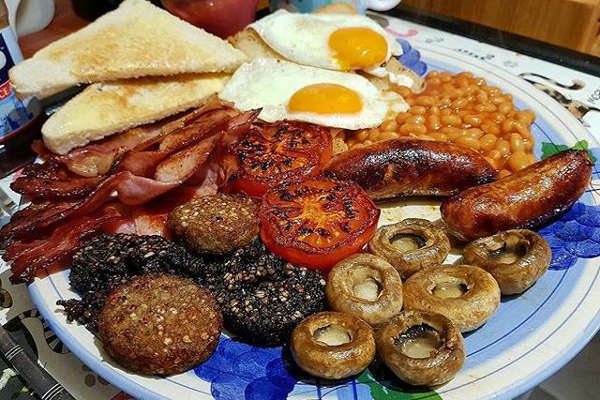 Some added extras can include beans and black pudding, and the slightly controversial hash browns as they are perceived as a non-traditional American import. The ingredients will differ by geographical location. To confuse things further, the county of Cornwall has its own traditional variation, which alongside the above ingredients can also include hog’s pudding (a local sausage), and Cornish potato cakes (fried mashed potatoes mixed with flour and butter). 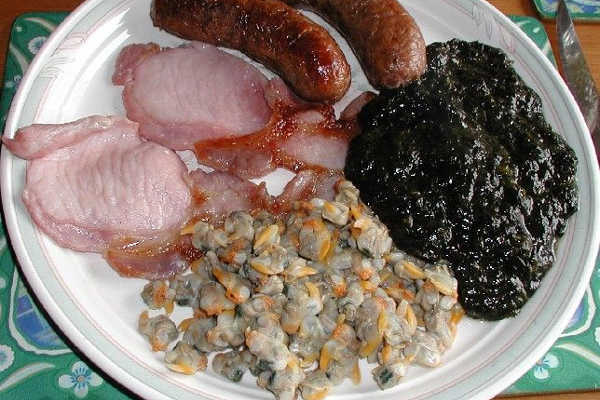 The Irish breakfast can contain the same ingredients as the full English but with a few interesting alternatives. The bread in particular comes in various forms. Soda bread, is a quick bread leavened with baking soda, and is a very delicious alternative. Potato farls are flat pieces of unleavened potato bread made with potato flour. Boxty is also sometimes used in place of soda bread; they are fried potato pancakes. White pudding is similar to a black pudding, except without the blood. It contains pork meat and oats but without blood it remains a lighter colour than black pudding. Meat products can differ, especially in Limerick where they include as much pork as possible. A piece of pork liver is a common addition to the full Irish. The Ulster Fry is the full breakfast associated with Northern Ireland, and is very similar to the full Irish breakfast. Instead of the typical soda bread loaf, the Ulster fry prefers the use of a soda farl. This is an single serve quadrant shaped flatbread cooked on a griddle. I spent three months in Northern Ireland writing my university dissertation, and I became particularly partial to toasted soda farls with poached eggs during that time. As well as the usual ingredients the full Scottish also includes Stornoway black pudding, white pudding, Lorne (square) sausage, Ayrshire middle bacon and tattie scones. Occasionally haggis, fruit pudding or Scottish oatcakes can be included. I spent five years in Scotland attending university and working. I am not keen on black pudding, I find the blood creates a metallic taste. However, a genuine Stornoway black pudding is the best blood sausage you will find. It was the first and only time I managed to eat a whole slice. The Welsh breakfast includes similar ingredients to the full English, but with two unique exceptions. Laverbread is a seaweed purée which is mixed with oats and fried, and actually tastes a lot better than it sounds. Welsh cockles are a local delicacy and are served alongside the laverbread. This makes the full Welsh breakfast unique in that it is the only version to include seafood. This is indicative of the countries long coastline influence. Russia – Syrniki (cottage cheese fritter). Italy – Croissant and coffee. The Netherlands – Apple pancakes. We hope you enjoyed this article on the European breakfast menu. 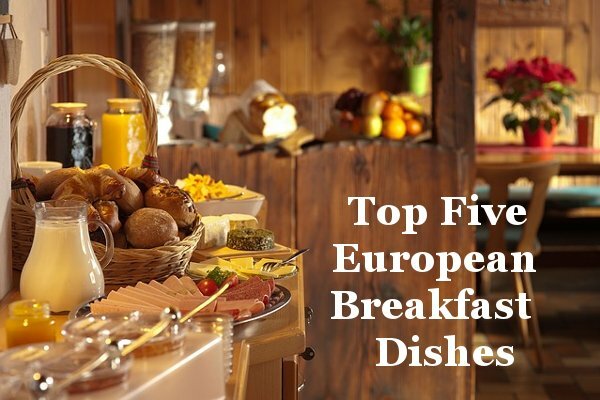 If you disagree with our choice of top five European breakfast dishes. Please let us know in the comments section below.